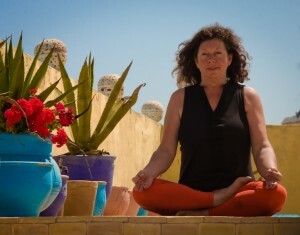 Yoga Holidays Morocco in a countryside retreat with pool. 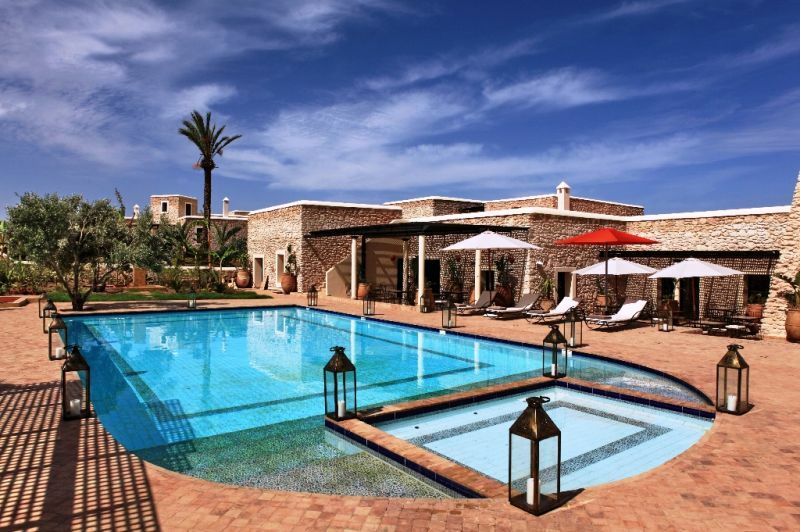 Yoga Holidays Morocco – a countryside location of luxury villas 15 mins from Essaouira. Choose one of the most relaxing yoga holidays Morocco has to offer and remember a holiday when your phone was out of reach. With small groups (up to six), enjoy a programme of yoga, healthy eating and swimming in a setting close to nature. Deepen your yoga practice and learn about Moroccan cooking with locally sourced seasonal ingredients infused with Moroccan spices. Cleanse your body with swimming and Hammams and generally relax in in luxury accommodation. After a week at this nature based location you’ll feel renewed, refreshed and inspired. A tranquil location is the setting in the Moroccan countryside for the week of Yoga. Surrounded by gardens, flowers and pine forests it’s the perfect setting for a week of recharging your batteries. Each day you’ll have two yoga classes with one of our resident Yoga teachers, Jo & Maria, including meditation sessions and breathing techniques. If you’re fairly new to yoga don’t worry you’ll be able to go at your own pace. If you’re deepening your existing practice, you’ll gain a stronger awareness of your mind, body and spirit connection after your five days of instruction. Naima is our cooking classes tutor and she will give you some healthy eating recipes with a local twist. The food here is locally grown and delicious; it’s not imported and the sun really does make a difference to flavour. You’ll return home with the desire for some healthy eating. 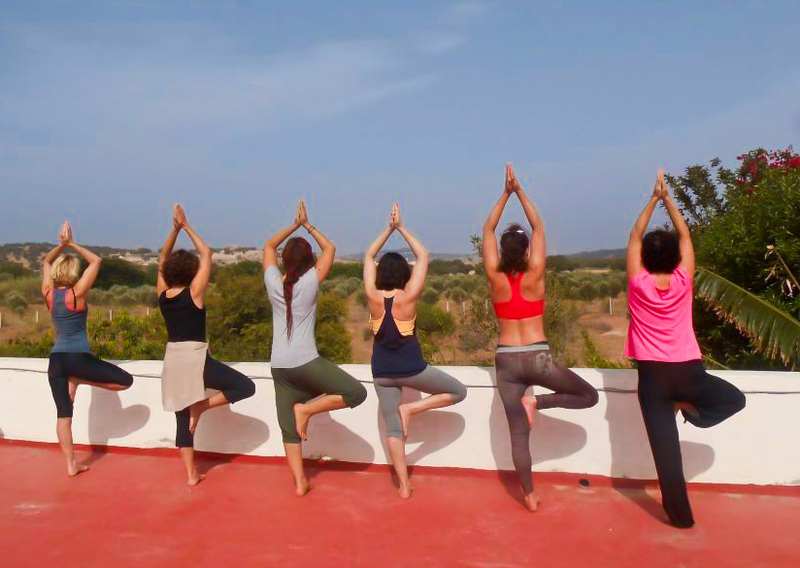 THE LOCATION for our Morocco Yoga holidays and retreats is in a hillside 15 mins from the medina of Essaouira. The villas are landscaped with many lawns and gardens to relax in whilst the daily shuttle connections keep you in touch with the medina if you want a little more hustle and bustle in the afternoons. The Main Villas house several large double rooms with en-suite, lounge and kitchen. Each villa has its own private gardens and swimming pool. The communal area includes a large swimming pool as seen above with ample areas for privacy. During most of the year yoga sessions will take place on the secluded lawns or inside the yoga room. The region of Essaouira is mostly verdant throughout the year – guests are always surprised by this but some intense winter rainfall ensures a green spring. It’s a UNESCO site and it’s famous port area is a big draw. The medina (market area) will have you feeling as though you’ve been transported to another time. Above all it’s a relaxed town to wander about in the afternoon and evening. Your programme includes visits into the medina. Six nights luxury accommodation with your own double en-suite room. There is no twin sharing and beds are double sized. 2 evening meals at restaurants in Essaouira specialising in vegetarian food. Two yoga classes per day in the garden or inside during the winter months. A guided tour of Essaouira’s relaxing souks (markets) including shopping tips. 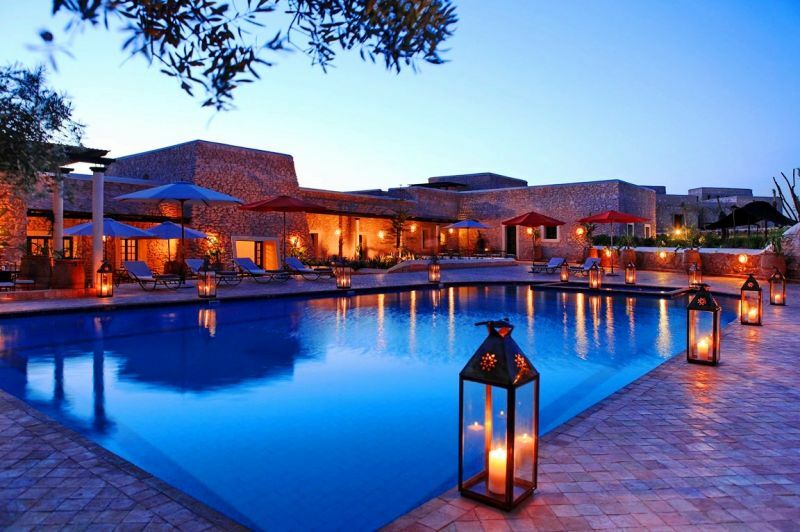 Transfers from and to Marrkesh or Essaouira airport. A bright start to the day with your morning yoga asana and pranayama (yogic breathing) class, will awaken and energize you. Jo is a qualified Yoga teacher with 20 years experience teaching in the UK. Her main specialisms are asana and pranayama. Whether you are an experienced yoga practitioner or a blossoming newcomer, you will learn to move with awareness, strength and balance. Discuss with Jo for your two daily yoga asana classes to be tailored to suit your specific body needs. The yoga retreats are focused around healthy eating so there’s generally no bread or diary on the menus and instead plenty of fruit and vegetables but if you wish to divert a little from this regime, you can choose to do so. All Ingredients are sourced locally and grown in Morocco; nothing is imported here. During this yoga and cooking holiday you will learn how to make your own healthy Moroccan dishes through Naima’s cooking workshops. Naima will teach you how to create delicious new versions of dishes that may sound familiar but will taste even better as well as more traditional Moroccan dishes. You will receive your own recipes to take home. depart for a flight between 15:30pm-19:00pm for the free airport transfer. PLEASE USE THE YOGA RETREATS CONTACT FORM BELOW TO MAKE YOUR RESERVATION FOR 6 NIGHTS AT £899. You can also book a 7th night.